Crop circles - Crop lodging (damaging, weakening). Explanation, decipher, decode, discovery, break code, explaining, decryption, puzzle out, scientific research. Better barley, beer, malt, brewery, brewing. The most important ideas contained in the following text: Researchers (self-appointed experts) crop circles never made something that is in professional research called the "blank test", or blind experiment, and did not go look at nodes of plants that are completely normally, irregularly flattened (damaged, weakened), outside of any patterns. (ie from the place where according to their opinion there were no "secret" energy. lodging (damaging, weakening). Basic principles. Crop circles and any other regular patterns do not include anything other than just quite commonly, normally flattened (weakened, damaged) crop, the same as occurs anywhere in the world. Any claim that nodes would never bend or extend under natural conditions in the way, that is usually found in patterns, is a nasty lie. As an apology of explorers possible show that in their case it is a lie wholly unconscious, from a shock, surprise and ignorance, and also sometime thanks to the utter lack of education and knowledge. Better barley, brewing, brewery, beer, malt, whisky. All previous research that have been in this area carried out anywhere in the world, were made from professional botanical - agricultural point of view even in really very dilettantish, amateur way, and the documentary evidence that were by these "experts" presented to the general public, possible compare with concealing evidence. There is not possible to expect from them anything better, not a hint, because really almost completely in all cases they were an absolute agricultural dilettante and amateurs. Although sometimes shielded their informations various professional degrees, skilful titles of research methods carried out(see), expert names of the laboratories that assist them in research, so they could lay public fairly thoroughly confused. From a statistical point of view are all their so far undertaken investigations totally inconclusive, therefore virtually worthless. For comparison: the total number of crop stalks per year, that are lodged (damaged, weakened) in all crop fields around the world, is possible to express by the number 1015. The vast majority of them exactly in the same way - without broken stalks, and from the very same reasons as in regular in patterns - many days after being damaged by electricity. 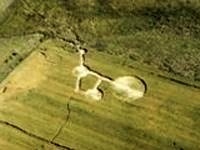 Crop Circles Explorers every year show hundreds of photographs, not exceeding one thousand of damaged stalks from patterns. (1012 times less, a million millions times less). All from the regular patterns, as well as for control photographed some other from undamaged parts of the field. Not a hint, not a chance, not even in the most hidden corners of their minds they would think that damaged stalks can also be found in completely irregularly lodged (damaged, weakened) crop areas, and certainly do not occur to go there and photograph something. Such research, possible say that it was carried out by intentionally subjective manner, in expert terminology botched. Stalks, which are damaged and look just like as in any regular pattern are occurring worldwide each year approximately one million more (in teh number of cases also square area) than of that found in regular patterns. No choice but to say that in the case of described research mystery believers really put a foot wrong, and what it is blank test (blind experiment), no one even heard in their whole life, or if perhaps a hint yes, if so, just only muddled it completely. For example, in medicine verifying the effects of placebo, but also used elsewhere in physics - zero correction, adjustment of measuring instruments. It is always first and foremost need to investigate what happened and what is the situation at control sites, where an expected phenomena did not happen. For the control point is imperative, therefore, consider not only a place where the crop is not flattened (damaged, weakened), but also that place where the crop is flattened (damaged, weakened) quite irregularly. But because the irregularly flattened (damaged, weakened) crop does not cause any mysterious and alien associations, is situated entirely outside any interest of crop circles explorers. In fact, the interest in them have to be completely on the first place. Nobody wants Crop Circles researchers to carry out their observations on the relevant number of stalks. Suppose 1010-1012, which would represent hundreds thousands square kilometers of lodged (damaged, weakened) crop. Where they made the biggest mistake in their observations throughout the past decades and how to remove it in the following year (2012) as well as further will be indicated in some of next paragraphs. One of the greatest mistakes made by completely all of the Crop Circles explorers, really totally and completely by all of them, once again, and finally, absolutely all of crop circle explorers committed as well as in any other regular patterns in crops, is the sad fact that they did not make so-called "zero correction" (also the blank test, blind experiment). Not a hint they thought to look and check, examine how it look crops at locations lodged (damaged, weakened) quite irregularly, completely outside the regular shapes, thus seemingly without the action of that by them so much adored, highlighted, completely incomprehensible even really mysterious forces. What would be they able discover there would be somewhat really very surprising, say more precisely a little shocking for them. Very serious error that was probably the worst of all, tehy Crop Circles explorers quite regularly practiced by the fact that stalks and plants studied only in two places. In regular patterns, where the corn was flattened (damaged, weakened), and outside, where was not. In their infinite simplicity they thought, that by examining and comparing not lodged (damaged, weakened) crops outside patterns something like a comparison, blank test (blind experiment) was performed. In their infinite simplicity they totally forgot that further comparative experiment must be carried out of there, where corn is flattened (damaged, weakened) quite irregularly. Each measuring instrument must be set to 0% and 100%, then it is possible to measure. The vast majority of common devices is factory set so that basically there is no need perform these two acts. About crops in the field that does not apply at all, because explorers who have ever moved in crop circles so far no one has ever knew where a 0 and 100% is, in contrast to for example agriculturists. As one of the strongest evidence of the sad fact that Crop Circles explorers never in their lives have been present in any field of crop on another place than at locations of regular patterns, are the Expulsion Cavities (Exploded Nodes, see - Google). In fact they were not caused at all by that what Crop Circles explorers report about them - neither pressure, nor gas. They are entirely natural growth changes, that occur during growing, ripening and gradual drying parts of plants. Shape changes of tissues, which are not yet fully dried and hardened, medium-soft, and when they are under pressure of the surrounding harder growing tissues. Never a pressure of gas. Note: the pressure of growing tissue is huge and is able to easily disturb masonry, clay brick, concrete, thus able more easily disrupt and reshape other, surrounding softer plant tissues in their immediate vicinity. What Crop Circles explorers called Expulsion Cavities (exploded nodes) are initially completely invisible, microscopic tissue deformations. They increase and spread during growth, in their vicinity occurs to further tissue withering away. All that may be already caused by entirely natural ripening and growing of the plant. Even almost dry parts of the plant in fact continue to fulfill one of their most important function - vascular, conductive tissue. Better beer, brewing, brewery, whiskey, barley, malt. At the beginning of all the damage was initially completely unobservable microscopic damage, by the naked eye completely unnoticeable. The cells are killed directly by electric current and electrolysis products, without mechanical damage. Most mechanical damage, thus seemingly resulting from gas pressure, are mere growth changes. Conclusive evidence is possible to create in any school bio lab plant, or flower-beds, without the action of any "mysterious" and not mysterious power. 1) would be found pattern, consisting of lodged (damaged, weakened) crop areas, whose majority of the stalks (estimated at over 90%) have stalks only bent but not broken, at a height of up to 5 cm above the ground, and they are all along their entire length straight, without any hint of of bent or extended nodes. Those (bend nodes), however, begin to appear almost immediately, even during the first few hours after lodging (damaging, weakening). (here will follow a few explanatory time - lapse photography). The rest of the stalks, mostly near the border of the regular shape, something below 10%, has stalks broken, but otherwise completely identical across all of straight length without any bent or extended nodes, without any shape change. Any change in shape, mostly nodes, as well as during growth variously twisted and damaged parts of plants in the pattern will really be created during the next hours, days and weeks. 2) case (as well as 3) relates primarily to barley, a little less partially observable also in other cereals such as wheat, rye, triticale and oats. In most cases maybe only a precursor, phase preceding to what was described before in (1). Would be discovered a pattern whose majority of the stalks does not lie on the ground at all, are only noticeably tilted to the side (a few degrees). This will provide in a structure of plants from a photographic (or typographic) point of view something like a significant change in the raster structure. Those would be very difficult to measure, but it is very well observable from a distance. (examples of enlarged grids hardly observable, good from a distance). 3) may be preceding Case 1 also 2. Plants may not yet have been deflected from the vertical growth direction, but have noticeably faded (change direction) the topmost leaf, as well as some below it, or heavily tilted spike against not affected plants. (changes in direction of spike relate almost exclusively to barley). Again, very good observable from a distance, like described raster change. Note: The rotation of the ears is quite inseparable to ripening of all common cereals except oats, that has the lats. Wheat, barley, rye, triticale - during the final stages of maturation, their ears will gradually turn from the original fully straight position 0 degrees up to the final state 180 degrees, when the ears are turned directly against the ground. Barley is very sensitive to any changes in conditions, that represent a significant stress factor for it, and rotation of the ears may take place considerably earlier, for example just on the areas that were damaged by electric shock. Given the structure and build of the ear (awns), such changes are very good noticeable against the surrounding, unaffected area. For wheat, rye, triticale, the ears starts turning really in the final stage of ripening, when the grains are almost fully developed and the plants are largely dry. Long ago lost a substantial portion of green color and during the ripening just kept depriving moisture (spring varieties after the beginning of July). On the barley may occur ear rotating immediately after full heading (spring varieties around mid-May), when the plants are still quite green and grain in the early stages of milk-stage ripeness. 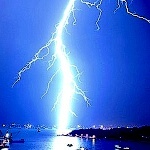 It occurs primarily just only at locations that were affected by electricity after lightning discharges. For wheat, rye, triticale hit by electric shock from lightning discharge occurs slowing maturation (similar to transplantation effect), and therefore the ears rotation occurs on the contrary significantly later. Better malt, brewing, whisky, barley, brewery, beer. If would any of crop circle explorers only once in their whole life visited the field also in places where the crop is normally, irregularly flattened (damaged, weakened), without any signs of regularity, that what they say so gracefully Expulsion Cavities would be found there as well. Would have found that even in a place where, according to their claims, was complete absence of any "mysterious, supernatural" energies, occurs to exactly the same growth changes and bending nodes, as well as Expulsion Cavities (Exploded Nodes) occur in the absolutely same manner. Note: it is quite not impossible that some of the explorers mentioned locations (with commonly, irregularly lodged (damaged, weakened) crop) sometime visited, and the fact that there exist exactly the same deformed nodes and plants, simply concealed to professional and general public. For something like that it is possible to use the term "a dirty trick of the worst caliber," and commit to it are able only people of extremely low moral qualities. Explorers of crop circles will be at this point recommended one good advice. They may not at all bother taking pictures of each stalk, their various deformations and bent nodes. Such images are displayed on the Internet every year several dozen, at most hundreds. Professionals and the general public may be somewhat confused by that. All that Crop Circles explorers they can be perfectly sure that on all the other fields around the whole world, where the crop is flattened (damaged, weakened) completely irregularly, the stalks look exactly the same. There are "only" a little more of them than of that found in regular patterns. An estimated 1015 yearly. That would not be able to photograph for them. Prof. Ernest Rutherford said that in science one should not never bet against the course more than 1012 to 1. It is even possible to attempt to blind the active intervention of the experimenter, some plants carefully bend almost to the ground, weight, let them grow for a while in an altered position, and observe how they behave in their nodes. In this case there is overwhelming evidence that the plants were no other further additional unknown or known force, and what happens to them, absolutely not caused by anything other than the action of geotropism and phototropism. There was present absolutely no mysterious power or gas released by electrolysis or thermal processes. Yet explorers crop circle may be sure that what they say Exploded Nodes or Expulsed Cavities after some time, completely inherently on (some) of described stalks will appear. Everyone, everyone, and once again, and the last time indeed every person in the world has the opportunity to make exactly the same photographs of bent and extended nodes, just in order to going on any crop field in an average distance of not more than a few hundred meters from his residence. 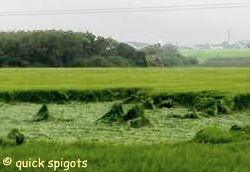 During the growing season there will certainly some flattened (damaged, weakened) crops appear, and if not, they can take their phones or DIGIpfoto and make a snap of the consequences of phototropism and geotropism effects to plants mechanically deflected from an upright position near the tractor tracks. Anyway, on the every square kilometer of corn fields is possible to find approximately at least a few hundred square meters of quite commonly lodged (damaged, weakened) crops. It is just a work of nature. In the temperate zone, which includes Czech Republic as well as adjacent Europe, there is an average of 2 to 3 lightning discharges per square kilometer yearly. Mentioned 2-3 discharges per square km mean discharges electromagnetically registered. In each of them may be except for the first Return Stroke contained a number of subsequent (3 - 5, as well as 15) RS, that may hit to approximately the same location. Sometimes to the exactly same place, but in some cases, tens to hundreds of meters apart. Each of the listed RS may contain a number, up to tens of parallel arms, which may in some cases strike on well farther than a few hundred meters apart. Described facts mean that one square kilometer of crop fields may be affected throughout the year, on average, sometimes two arms of lightning discharges and nothing more, but also up to several hundreds. To Crop Circles patterns explorers in crops would be only the strongest possible terms recommend, that from the next season (2012) very thoroughly visited also the places where possible find quite commonly, irregularly flattened (damaged, weakened) crop (or them to do so at least once, for the first time). To try to photograph plants and their physiological changes in such a place, and also try to understand what was approximately happening there. Here's a hint: absolutely the same as on the places where are found that their fun regular patterns. Only without a very random and rare manifestations of interference and resonance effects, as well as any other very random effects, that would give rise to at least a single circle. Note: The recommendations from the previous paragraph, and criticism in the preceding paragraphs shall not apply to Crop Circles explorers and photographers from Italy, who discovered something like that many years ago. One link of gratitude and with praise for example Here.